Okay, you guys. This week, I have literally been counting my blessings, thanking my lucky stars, and everything in between, that I do not have celiac disease. Not that I’m saying anything about lifestyle choices, or what have you; I’m just extremely grateful that it’s not something I have to deal with, much in the same way that I’m extremely grateful I don’t have to deal with diabetes, cancer, or lupus. Because, holy cow, gluten-free breads are generally awful! Or at least, the ones I’ve been cranking out have been, anyway (with the exception of those blueberry almond muffins, which were delicious). Maybe I’m as yet unskilled in the obviously delicate and finicky art of gluten-free baking, which is a definite likelihood; but they don’t tend to hold much of a candle to glutinous breads. This bread is, sadly, no exception – though it did turn out pretty well, all said and done. My dough took forever to rise, probably because my liquid was cold when I added it, and I think I undermeasured my yeast (but I’m not entirely sure there). Not only that, but while cooking, it turned an amazingly dark color before it was fully baked. I have amended the recipe to account for those problems; but even with all that, it still turned out to be a fairly decent, um, bread. Though the “crust” turned out dark, it lent a sort of burnt-caramel note, which was not unpleasant with the sweet almond flavor. You’ll note that I put the word “crust” in quotes there, because my “bread” turned out very soft, more cake-like than anything else. 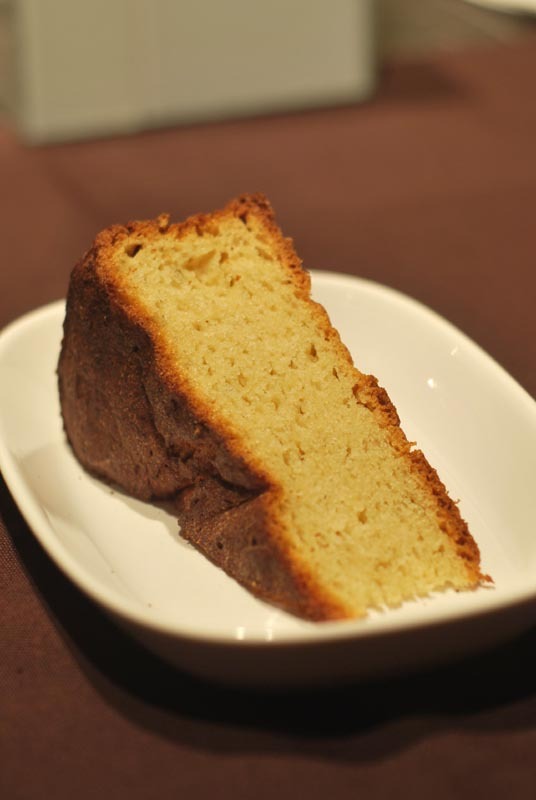 The crumb was soft like a cake, sweet like an under-sweet tea cake, and full of almond and honey flavors. I’m sure the fault was mine, since the original recipe called for millet flour, and I just could not find any. “What difference could that make,” says I, “I’ll just substitute sorghum flour, and it’ll be fine!” Well, not exactly. I’m fairly sure that had I used millet flour, it would’ve turned out far more bready. But that’s in the past now. What I give you below is either a soft almond bread or a yeasted almond cake recipe, but both are gluten-free; so, win! If you wanted a gluten-free cake, you could certainly increase the amount of sugar to play that up. I found the flavor overall to be moderately sweet, but not any more that of a standard muffin. The almond flavor was not overwelming, as I feared it might be, but was more of a seductive backdrop. It was in perfect balance with the honey, just enough to make you wonder exactly what that familiar flavor was. The texture ends up an awful lot like an angel food cake, which is not a bad thing for a cake, but not necessarily what you want in a bread. If you’re making a layer cake, I suggest cutting the crusts off, so you have a pristine canvas for decorating. The interior did turn out a rather gorgeous pale color, which would be just beautiful with any type or color of frosting. Oh my gosh, you could just frost this bread with Nutella (yes, it is gluten-free)! It’s the best of all possible worlds; who cares if it’s bread or cake when it’s covered with Nutella! I might go home and do just that. Almond-honey cake with chocolate-hazelnut frosting, anyone? 1. Grease a 9 inch cake pan, and line the bottom with a round piece of parchment. Grease the parchment. In the bowl of a stand mixer, whisk together the flours, almond meal, salt, sugar, and xanthan gum. Whisk in the yeast. 2. Combine the honey and warm milk, and stir until the honey has dissolved. Add the club soda, butter, vinegar, and almond extract. Add to the flour mixture in the bowl. Add half of the egg mixture, and mix with the paddle attachment until incorporated, scraping the bowl if necessary. If the mixture looks dry, add the remaining egg by tablespoons until the consistency resembles cake frosting, or thick batter. It should hold its shape, and not be runny. Continue to beat at medium speed until dough is smooth, scraping bowl down as needed. 3. Scrape the dough into the prepared cake pan. Using a nonstick or oiled spatula, smooth the top. Loosely cover dough with oiled plastic wrap, and let rise in a warm place until doubled in size, about 1 1/2 to 2 hours. 4. 30 minutes before baking, preheat the oven to 325° F. Bake the bread until baked through, and the top is nicely browned, about 40 to 50 minutes. An instant-read thermometer should register around 200° to 205° F when done. Check on the bread after 30 minutes, and tent loosely with aluminum foil if it starts darkening too much. When fully baked, run a thin knife around the edge of the pan to loosen the bread. Remove the bread from pan, peel off the parchment paper, and transfer to a wire rack to cool. 1. The original recipe called for millet flour, which I was unable to find, so I substituted sorghum flour. Use whichever one you prefer. 2. If you would like to make this into a cake (a cake with yeast? why not! ), I suggest adding an additional 2 or 3 tablespoons of white sugar, and possibly also increasing the milk to 1/3 cup. Proceed at your own risk!